Check out these fantastic designs and ideas. Retaining walls are practical and beautiful elements to include in a landscape. When referring to retaining walls, there’s an age-old debate about what’s more important – form or function. It goes without saying that function is a top priority, but this does not mean that form must be neglected. 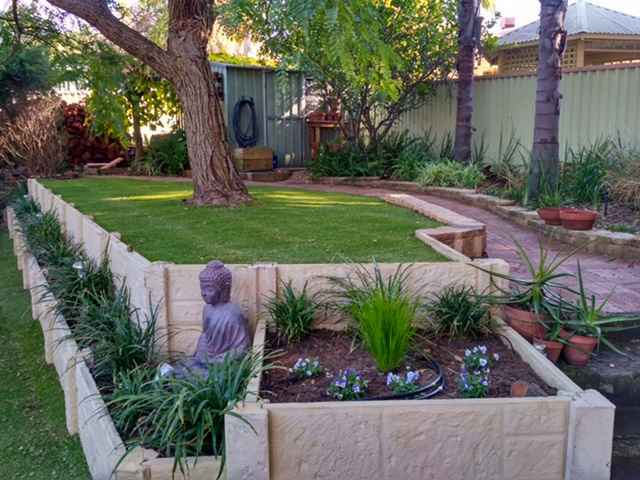 There are many ways to make small or large, simple or complex retaining walls visually pleasing. If designed well and constructed with quality materials, your retaining wall will be the pivotal point in your property rather than something you try to hide. Retaining walls are practical and beautiful elements to include in a landscape. They can help solve a variety of problems and offer unique planting opportunities as well. Retaining wall design ideas can be simple or complex – boulder walls, stone walls, wood, concrete, etc. can be used as materials. The choice of these materials will depend on the amount of work to be done for the wall construction. Bricks are a common material used to construct retaining walls. However, bricks should be used only when the wall will not bear heavy loads or as an element of design. Particular attention should be paid to the thickness of the brick wall. Nowadays bricks are not widely used as construction material for retaining walls because of the high cost and low durability. Natural stone is one of the most popular materials for constructing retaining walls. Natural stone is very effective, sturdy and durable but is also an expensive material. There are several types of stones which are used for the construction – limestone, sandstone, granite, slate, boulder, river pebbles. The choice offered by nature is very rich, but it is better to look for natural stone that is typical for the area. When building natural stone retaining walls you can use a dry masonry or cement. Dry masonry means that instead of using cement, the slots are filled with soil into which plants are planted which indirectly enhance the appearance of the wall. Boulder retaining walls are one of the varieties, which have a great visual appeal in addition to the functionality and durability. Concrete is perhaps the most popular and reliable material for the construction of retaining walls. With proper calculation and reinforcement, these designs will handle any load. When using concrete, homeowners can opt for pre-cast concrete blocks, which are especially designed for retaining wall construction. Another option is to choose concrete planters, which also come in different colours and add decorative value to the supporting structure. Cinder blocks are another cost effective material that is widely used for retaining walls. They are made of cement and various types of combinations and the low cost, good durability and lightweight make them a popular option among homeowners and DIY enthusiasts. Wood is another material that can be used for building a retaining wall. This is an attractive option for many homeowners who work on a budget or prefer a DIY project. Wooden retaining walls are durable enough and decorative. They can be made from a bar or logs that have been cut into the desired size. The upper ends are treated with antiseptic, and buried in the ground is best treated with hot engine oil, creosote, tar or bitumen. Allow it to ‘soak’ into the wood after which, the wooden retaining structures will reliably serve for many years without rotting. Retaining walls made of gabions are especially popular nowadays. Gabions are tubes with a rectangular shape and it comes in various sizes. Filled with river or quarry stones the baskets (containers) are aligned with a grid network. The construction of a gabion retaining wall is very easy and if the wall is small you will not need foundation. Gabions are efficient and environmentally friendly and in terms of appearance homeowners can fill the baskets with anything they choose – from cobblestone, pebbles and boulders to any other material.